A typical desert safari is thrilling for adults as well as youngsters and includes dune bashing –a rollercoaster ride in an SUV going up and down the sand dunes – dinner at a desert camp with entertainment, camel rides, henna painting and a falcon display. Most popular companies for this sort of safari include Desert Rangers and Arabian Adventures. Since dune bashing is not suitable for children under 8 years old the alternatives include a Platinum Heritage safari – the most upmarket in Dubai – which doesn’t involve dune bashing but does include crossing the desert in vintage 1950s Landrovers and getting up close with wildlife such as rare Arabian oryx and gazelles. Or, for a bespoke safari, choose Destination Insight who will design a trip just for you which can include dune bashing or not depending on the age of the children. There’s also the option to spend a night camping in the desert and falling asleep under a million stars. Dubai’s original water park is a thrilling day out for adults and children alike and a great way to keep cool in Dubai’s searing heat. With the largest number of rides of any water park in the country, there’s something for all ages from the thrilling Burj Surj to a lazy river to surfing rides. There are also plenty of sunbeds and shade for when the excitement gets a bit too much. It might be 45C outside in summer but that doesn’t mean you can’t throw snowballs! Experienced skiers and snowboards can hit the slopes, including the world’s first indoor black run. Non skiers can have fun in the Snow Park which offers tobogganing, a snow cavern and good old snowball fights. Ski clothes are included in the cost of entry but bring your own hat and gloves. 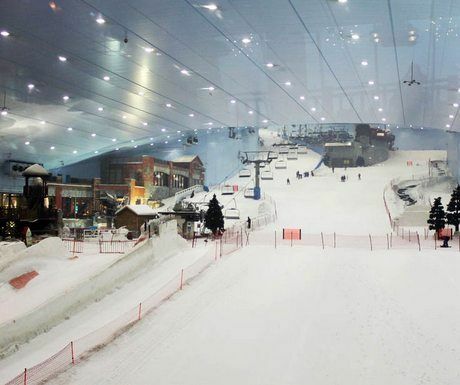 Ski Dubai is in Mall of the Emirates so there’s the opportunity to combine a visit there with shopping and eating in the mall. In the world’s biggest mall, Dubai Mall, you’ll find a city built to kiddie scale where children can role play performing adult jobs. From police officer to doctor to journalist to bank teller, children work and earn ‘kidzos’ currency which they can spend in the shops in this mini city. Ideal for children from ages 5 to 12. Also in the mall is Sega Republic, an indoor amusement park with amusement games and video and arcade games, Sega Republic is sure to keep older children happy for many an hour. The ice skating rink in Dubai Mall is right in there amongst the 1200 shops and is suitable for beginners to advanced skaters and offers classes as well as evening disco sessions. If your kids fancy a break from shopping for a while this might just be the answer. Also located in Dubai Mall, the 10 million litre aquarium tank hosts over 140 species of sea creatures including over 300 sharks and rays. Watch from outside in the mall for free or pay to walk through the underwater tunnel, do a snorkel cage dive or get there in there with the fishes and do a shark dive. Back on dry land, kids will be thrilled with the camel rides available on the beach. Just head for Dubai’s most popular beach, the JBR beach, and look out for the ships of the desert. Short rides are available for 50 dirham. In old Dubai parents will love exploring the gold, spice and textile souqs but for youngsters the best thrill is getting out on the water of Dubai Creek. Hop onto a public abra – traditional wooden water taxi – with the locals who use it to commute back and forth across Dubai’s busy waterway or hire your own abra for an hour and glide up and down the Creek spotting cargo dhows and other water traffic. The beautiful Zabeel Park not only offers greenery, boat rides, and a barbeque area but also an interactive Technology Zone where kids can learn as they play. Situated alongside Dubai Creek, this park offers a welcome green space offering children’s playgrounds, mini golf, go-karts and picnic areas. It’s also home to Children’s City, an area where children from 2-15 can play, discover and learn about the world we live in. For an elevated view of the park and Dubai Creek, hop on the cable car for a ride 30m above the ground. Zoom up the world’s tallest tower in one of the world’s fast lifts for panoramic views across Dubai. Children will be thrilled with see how small the buildings and cars look from so high up. There are also fun and educational exhibits about the building’s construction. Sunset is the most popular time to visit the ‘At the Top’ observation floor so it’s best to buy tickets as soon as they become available online, 30 days in advance. Directly beneath Burj Khalifa are the huge musical fountains which shoots water up to 500ft in the air. Best viewed after dark, there are shows every half hour until late in the evening and you can even take a boat through the fountains. Designed and built by the same company who built the fountain at Bellagio hotel in Las Vegas the Dubai Fountain is similar but, this being Dubai, is bigger and taller. From ultra modern Dubai step back in time to visit the DubaiDino at Dubai Mall, a real Diplodocus longus. This 24m long beast from the Jurassic period was shipping to Dubai from its original home in Wyoming, USA and is a must-visit for any budding paleontologists in the family. If the running around gets too much for you and a day of hotel relaxation beckons then the kids will love to join in the fun of your hotel’s kids’ club. Many Dubai hotels have kids’ clubs with the Sinbad Clubs at Jumeirah hotels generally considered to be the best with their well trained staff and excellent facilities. I’ve never been to Dubai but am really tempted. I know, obviously, women need to be aware of the culture when it comes to dress but about for children? Enjoy with kids Zabeel Park and Kids’ clubs. Other things places specially for adults. I enjoy single and also family tour. really awesome experience everytime visit.